This scene occurs right before the climatic projection tunnel horse race sequence. The animatronic fox “walks/runs” along the wall and then ducks behind it as the animatronic hunter and dog come along from either side and follow you around as you disorient the rider and he ends up in the pond. The interesting thing in this scene is that I think it would be cool for it all to happen in the same room – and also efficient to save on animatronics. So that’s how its rendered here. Though I’m not positive the timing would work – would have to study it further. Anyway, I’m really happy with how this image turned out. Author themeparkconceptsPosted on May 31, 2017 Categories Concept ArtTags concept, concept art, digital painting, disney, epcot, jolly holiday, mary poppins, themed entertainmentLeave a comment on Supercalifragilisticexpialidocious! 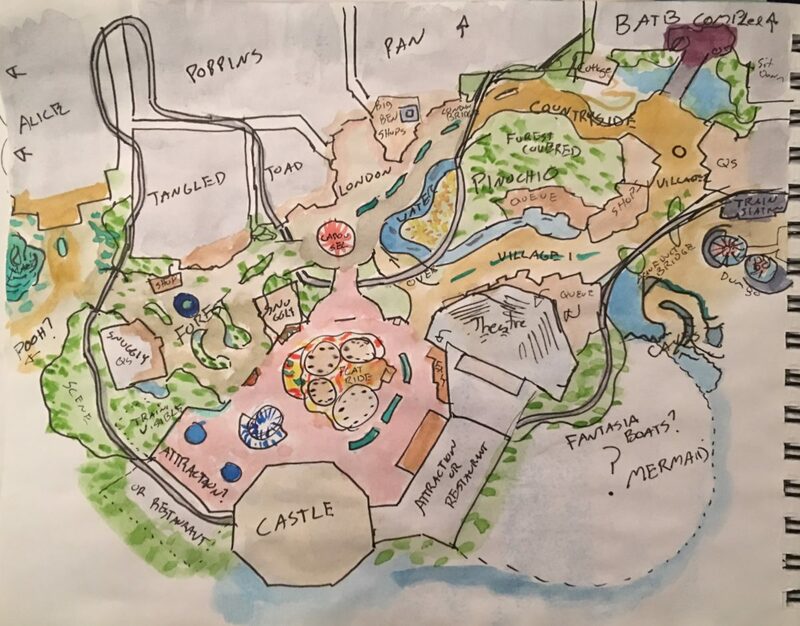 I was working with a bunch of people on a fan-made Fantasyland on a Disney fan site and made up this overview and layout based on some of the ideas discussed. I can’t take complete credit for the ideas here, many people discussed them, but the layout is mostly mine and I’m really fond of it – hence my posting. Just a quick rundown of the image. The center of fantasyland starts of fun in the castle courtyard which is home to a flat ride or two and possibly a restaurant, some gift shops, the exit to the theater. The courtyard is elevated compared to the rest of the land. From there bridges extend out into the rest of the land – split into the Forest, London, and the countryside sort of mini-lands. Casey Jr train – a sort of WedWay runs throughout the land going above and below grade and running through most of the show buildings encountering glimpses of other rides and exclusive scenes from properties not otherwise featured in the land. Anyway that’s the super quick rundown, most of the rest is self explanatory. 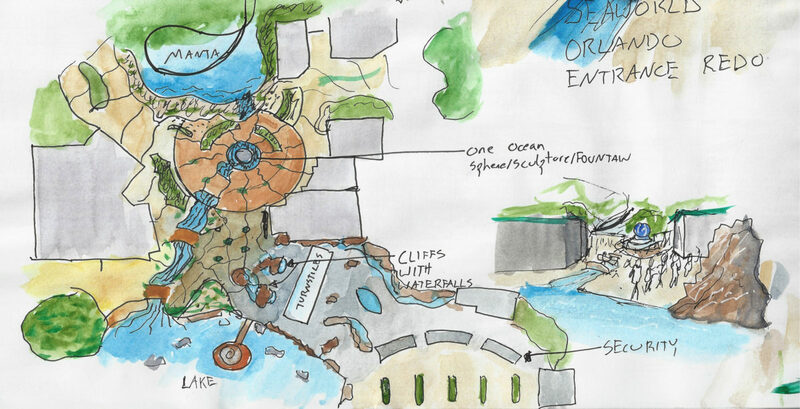 The project itself has evolved from there but I really liked this layout and selection of attractions. What do you thjnk? If you’ve browsed this site at all you may have come across my Adventureland side project. And you also might be aware that I’ve been self-teaching myself art (and also a bit of 3d modeling) for the last year and a half or so. 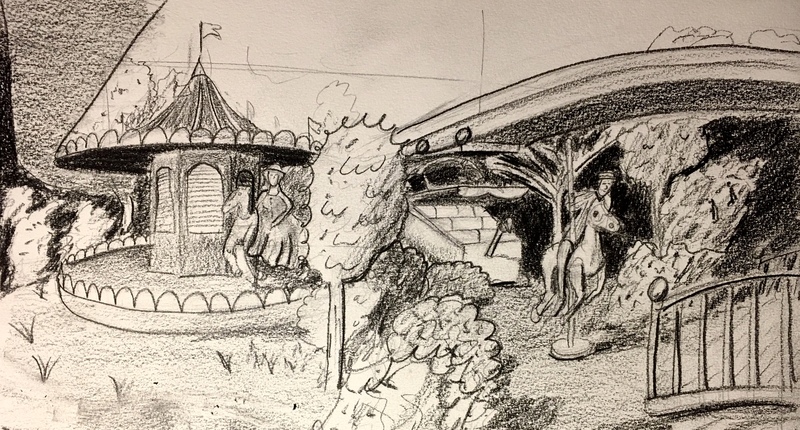 In fact, the first piece of concept art I ever tried to make I drew just a little over a year ago and it was of this Adventureland. I think I’ve come quite a ways since then and made a lot of progress. It’s easy to lose sight of overall progress when focused on the day to day and week to week work. And I continue to try to improve those skills and acquire new ones. In that vein, (and in part due to a recently acquired iPad Pro), I’ve been slowly approaching the world of digital art. Talk about needing to learn a lot. Eeesh. I’m particularly interested in digital painting, and using a more painterly style because that process of going from vague shapes to more and more refined detail appeals to me a lot as that’s generally how I already think – linework I find to be agonizing and hindering. Plus it just looks cool. So it’s been something I’ve been wanting to add to my repertoire in addition to digital skills in general. Anyway this is long-winded way of saying that I recently attempted to redo this piece of art digitally and in that painterly style – no linework. It took a lot longer than I thought it would, the results aren’t perfect, and there’s a lot I found myself struggling to figure out how to figure out. But I also like it. So here it is, the new aerial rendering of my Adventureland. So what do you think? As always I love feedback. And for more details about the land itself be sure to check out the project page here. 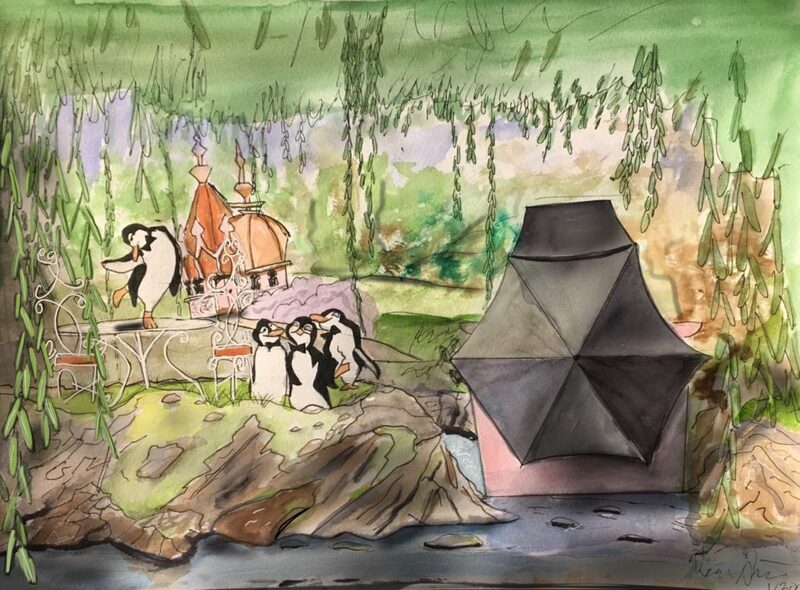 Not much to say this time – just here’s a new piece I did visualizing the penguin scene of the ride. 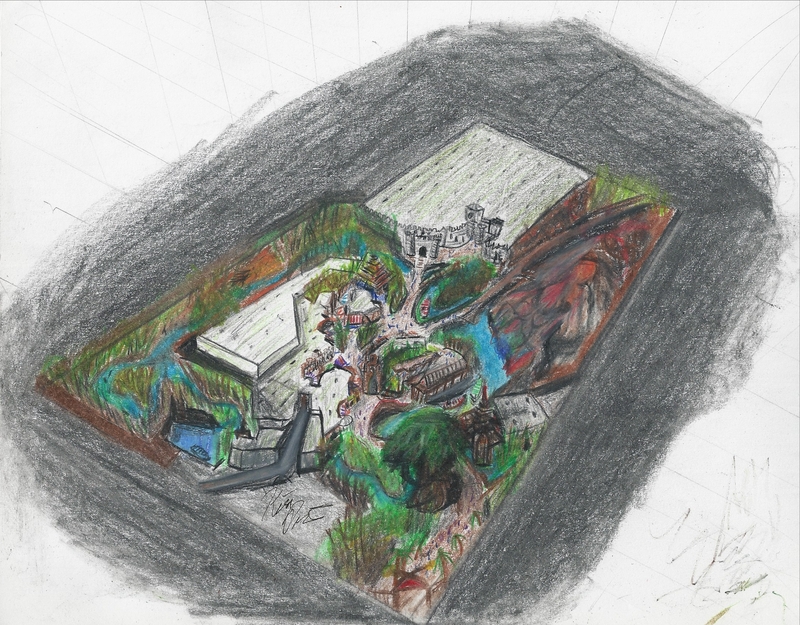 The vehicle moves around the island in a circle while really great animatronic penguins dance away (and maybe jump through the canopy of the ride vehicle!). As always I love feedback and hope you enjoy! For everything Jolly Holiday check out the project page. Hello again! Today a visit to 2nd tier of themed entertainment: Seaworld Orlando. I actually really like Seaworld Orlando. Views on animals in captivity and recent controversies aside, the park itself is a really pleasant and attractive place to be with some fantastic coasters (if perhaps less than fantastic other rides). While I often say I grew up at Walt Disney World, since it was 15 minutes away from my house and both my parents worked there and we were therefore there very often, it’s actually probably more accurate to say I grew up at Seaworld. My house was within walking distance of the front gates (not that I ever actually have walked there – should try that some time), my family loved the place because of all the shows and as a nice place to walk, and we probably were there a good deal more than Disney- at least until I became a tad older and wanted to ride more rides. Keep in mind there were nearly no rides at Seaworld during this period – only the sky tower and Wild Arctic. Later there was Journey to Atlantis (which I have ridden a record 13 times in a row without disembarking) and Kraken (which was my first “big kid” roller coaster). But there was an amazing playground! (which the good part of doesn’t exist anymore). So lots of fond memories, lots of experience with walking around and seeing the sights, lots of sadness around the lack of water-skiing shows these days. Happy New Year! (Again, I think – I need to log on to this site more). Today I come with a new, more detailed site plan for Jolly Holiday. This is probably the closest I’ve gotten to something that could actually be built, and also stays relatively compact. I’m really happy with it. The only thing I would change is that currently there are two maintenance areas – one for vehicles, and one for the horses – and I think there’s enough room that they could just be combined into one. 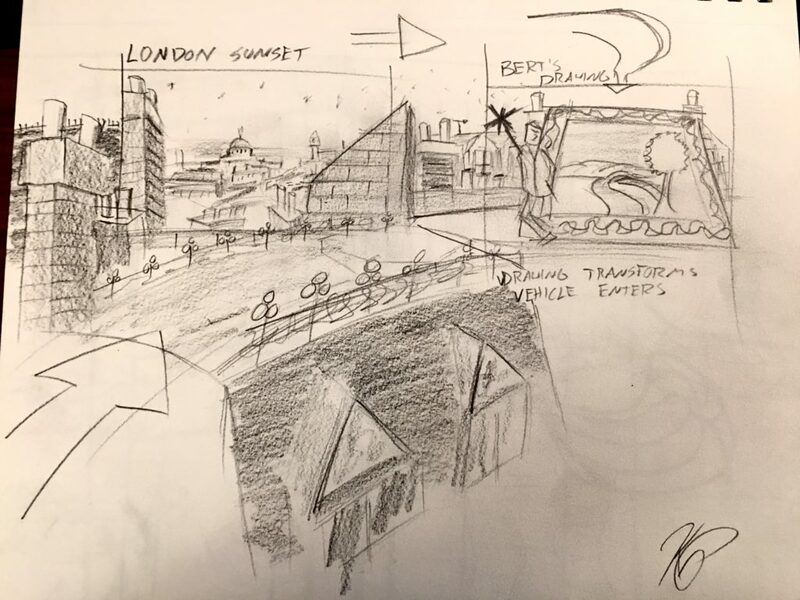 While I’d be happy to see it anywhere, the design has always been geared towards Epcot and the UK pavilion – so as I’ve refined it I’ve definitely kept that in mind. As you can see it fits very nicely there (obviously getting rid of Millenium village is necessary )and leaves plenty of room next door for a new pavilion. So what do you think? Love feedback as always. Also I probably should have cropped some of these images. You live and learn I guess starting off a new blog. LOL. Anyway, I had a series of images mostly just pop into my head and I decided to try and put them down. So here’s an idea for a theme park show or immersiveish experience (at least one scene would make it impossible for normal theatre). Author themeparkconceptsPosted on December 16, 2016 December 16, 2016 Categories Concept Art, Concepts, SketchesTags a christmas carol, concept, concept art, immersive theatre, ink and wash, set design, show, sketch, theatre, watercolorLeave a comment on A Christmas Carol! Jolly Holiday Update! The Horse Race. Today here’s an image from the climax of the ride where you join the horse race and the jockeys ride alongside you accompanied by a rousing score. The scene takes place in a series of 3 speed tunnels laid out in the shape of a horse track. 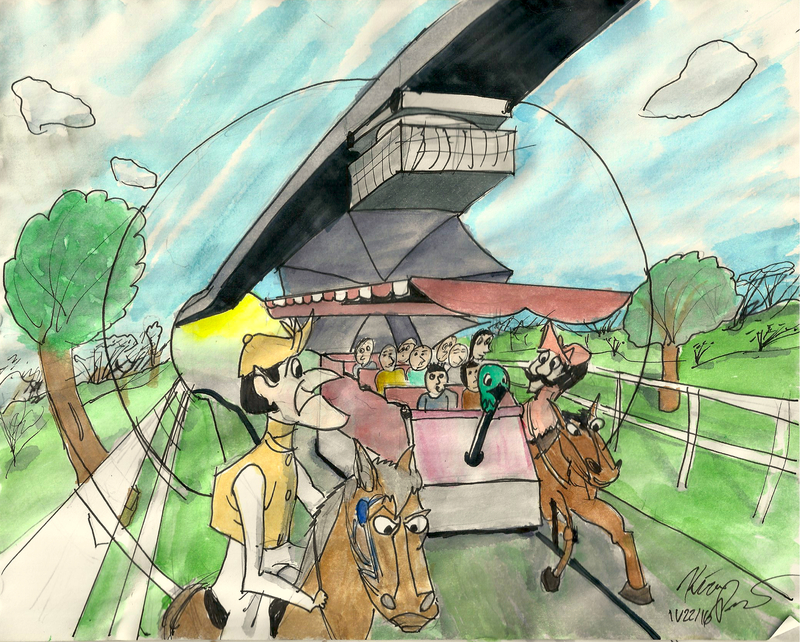 The backgrounds are project but the jockeys are animatronics that ride along side you, neck and neck. Eventually Mary Poppins sends the wind to help you along and you’re lifted above the riders to the finish line. For the full rundown of the Jolly Holiday attraction please check out the page. What do you think? 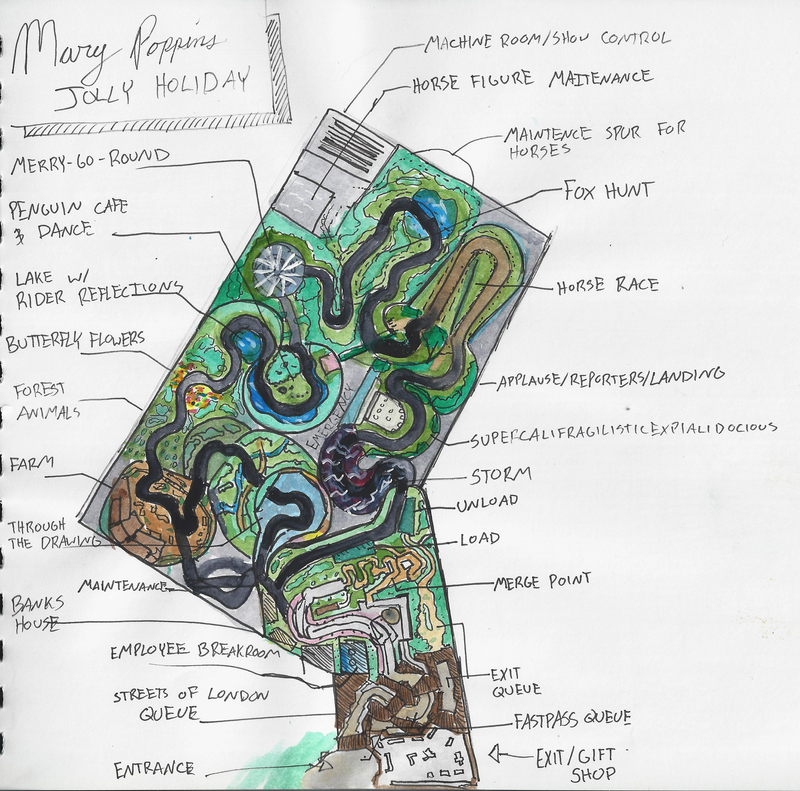 Author themeparkconceptsPosted on November 22, 2016 Categories Concept Art, ConceptsTags concept, concept art, disney, epcot, horse race, ink and wash, jolly holiday, mary poppins, watercolorLeave a comment on Jolly Holiday Update! The Horse Race.